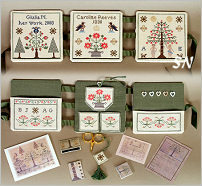 Here is a sampling of a lovely collection of designs by Italian designer Guilia Manfredini. 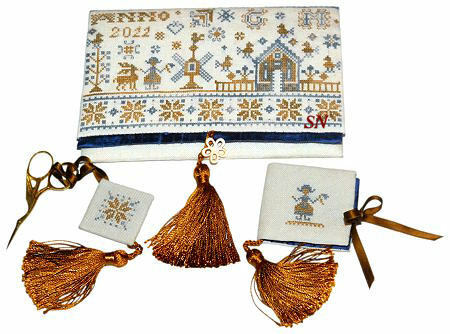 From Massa, a small town in Tuscany, not far from Pisa and the seacoast, we are treated to Italy through her needlework! Guilia is a Doctor of Nuclear Medicine and an Endocrinologist by trade... and a wife, mom and needle artist all the rest of the time! I was drawn to her work because of the Deruta Majolica (pronounced ma-jol'-i-ca, with the emphasis on jol, all short sounds on the vowels) patterns and beads she offers... but there is so much more here to enjoy! 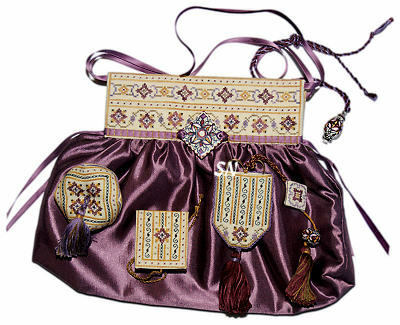 Biscornu designs, sewing caskets, etui patterns... lots of silks and overdyed color, pretty handmade clay flower pins that adorn many projects... no one specialty of designs... just a world of wonderful things... all the way from a charming part of Italy! I couldn't resist these one-of-a-kind GORGEOUS pins that traveled all the way from Italy in Giulia's suitcase! There are awfully difficult to take back to the shop after they are sitting here beside me! I bought only 6 sets of each! 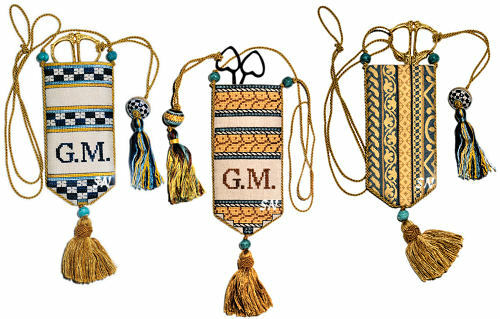 Raffaellesco Deruta Bead -- This is a pair of beads designed to dress up a tassel or cording. Use it as a finishing dressing on a fob or pin cushion. The main pottery bead measures approx 1-1/4 inches x 1. It is LOVELY and hand-painted with the famous Raffaellesco pattern There is a matching 1/2 inch soft green bead to compliment. You'll need to find something special for this! I love this charming little thing! Stitched on Weeks hand-dyed linen -- match your cut to the finishing fabric provided in this chart. (The model in the pic has linen that is a little too white... we can match that better.) Pillow finishes approx 7 x 8, the stitching -- with Algerian Eyes, Eyelets and Diagonal Satins mimics the pattern on the blue and taupe finishing fabric. Presented as the chart WITH ALL the necessary finishing bits -- all directly from Giulia and Italy -- the assembly instructions are clear with great photographs. Also included are those patterned fabrics, cording, gold 3-1/2 inch embroidery scissors, and the gorgeous gold, white and blue pins! A very pretty presentation. 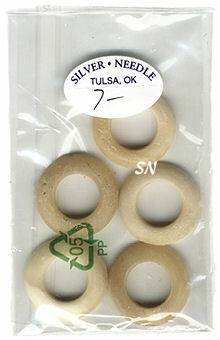 Real Bone Rings -- NOT plastic! 7/8 Inch real bone rings for finishing inside sewing cases and such... let's not ask 'whose bones' these were!!! Hard to find the real things! This is cool! It is a stitched tri-fold etui case featuring 3 design panels on the outside, and 5 more on the inside! A space for scissors, needles and threads, it finishes about 4 x 4 when closed. The COOLEST little accessories from In the Company of Friends come with it! 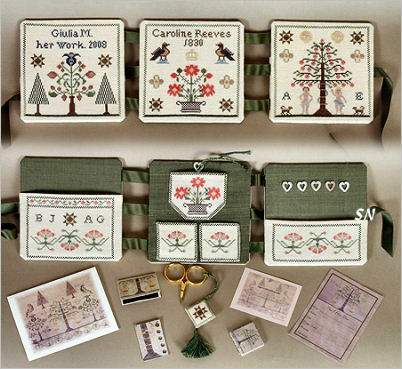 You get a paper thread board, pin keep, some book plate stickers... all with the printed artwork from an antique Adam & Eve sampler on them. Presented as Guilia's chart with assembly instructions and all the little paper accessories! What a charming scene on the front of this sewing case! A dutch cottage, girl, windmill, and lots of birds scattered about, it is stitched with only two colors of Belle Soie Silk -- Pecan Pie (DMC 420) and Puritan Blue (931). The chart includes the pretty flower mother-of-pearl shanked button you see as the closure. 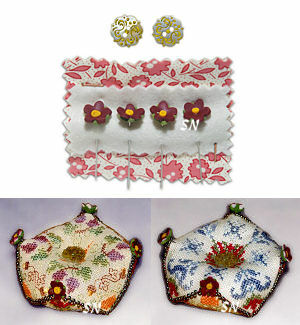 An elegant sewing set -- you might want to look outside the box -- and not finish this into the purse shape! It features an authentic hand-made Deruta majolica bead for one of your fobs, and the 1-1/2 inch square majolica piece you attach as adornment. You can see it used where the clasp for the purse might be. Giulia commissioned the beads through the Academy of Deruta Work in Umbria, Italy, then designed the sewing pieces to match! 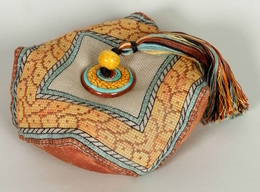 You can see the square medallion on the purse front -- it measures approx 1-1/2 inches square, and matches the round-ish Fuseruola bead that adorns the scissor fob. Pretty border designs -- do something creative eith this -- you HAVE the REAL beads in here to embellish! Presented as the chart with assembly instructions AND the two majolica pieces. What an intricate and exquisite thread winder to tuck into one of your special sewing cases!!! Gently curved, a mere 2 x 2 of fillagreed detail, isn't it pretty? The designs offered in this pack match biscornu charts farther along on our Giulia pages. Very traditional Deruta majolica patterns featured on Italian pottery, you are offered both colorways (click the image to see them both) in the charts... and one bead set to finish your case. Finishing approx 3 x 6, each case has three solid beads, and the decorated one to decorate your scissors. 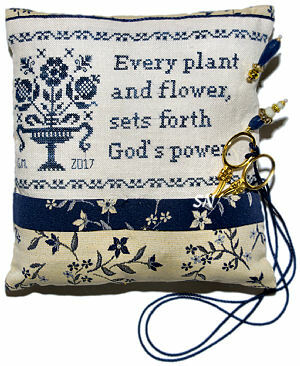 Simple cross stitches and finishing... the charm of these pieces is not lost on Deruta pottery lovers! Seasonal Faces -- Biscornu Cushions for The Seasons! 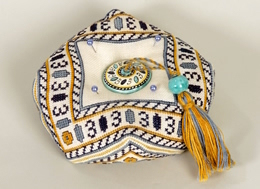 A team effort by Italian designers Guilia Manfredini and Maria Teresa Vitali, these pin cushions are STUNNING!!! Pretty seasonal florals of thistles, roses and acorns, their Biscornu shape is fast becoming a finishing favorite these days! Two squares of linen, sewn together... the corners are simply offset! Offered as charted designs, Guilia and Maria have split the seasons... Spring and Summer are offered together in one set, and Autumn with Winter in the other. Each cushion features stitching on both sides, a lovely Mother-of-Pearl button in both centers, and 4 awesome, handmade pins, decorated with clay flowers on the tops. You see those decorating 4 of the corners... so if you flip over your cushion... move the pins to the four corners that are NOW facing up! Deruta Biscornus with Italian Majolica Beads! These are two pin cushions that match the scissor cases Guilia has designed.. Each is inspired by Italian pottery designs from Deruta, Italy... and the charts INCLUDE the actual hand-painted pottery beads for the center finishing!!! I personally LOVE these... stitched on 32ct they finish approx 4 x 4. Lovely bits of Italy! OHHHH... more and more... we are offering a smattering of open-stock thimbles to match Guilia's cushions, biscornus and scissor sheaths! 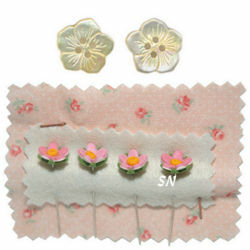 The thimbles are simply a MUST to go with the rest of your stitched pieces! Each is unique, each is hand painted by Deruta... no two are alike... and I want them ALL!! !